How come the values differ so much? It is because the coastline is fractal in nature and the measured length depends strongly on the “ruler” or unit of length used. A straight line – like a road – has dimension 1 and a plane surface – like a field – has dimension 2. But some curves – like coastlines – are so wiggly that they have a dimension between 1 and 2. Such curves, with fractional dimensions, are called fractals. 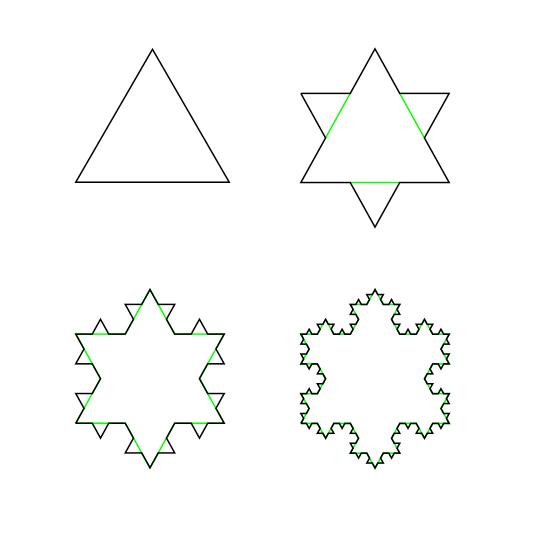 The length of the snowflake grows without limit as the subdivision process continues: each step adds one third to the length, so at stage N it is (4/3)N times the length of the original triangle, growing exponentially with N. The fractal dimension of the snowflake is log 4 / log 3 ≈ 1.26. Fractals were considered by the English Quaker mathematician Lewis Fry Richardson. When he measured the length of the west coast of Britain, his estimates varied widely with the scale of the map he was using. Larger scale maps include finer detail, resulting in a longer coastal length. As we may choose to include variations corresponding to every rock, pebble or grain of sand, it is impossible to assign a length unequivocally. All we can do is to describe how the length varies with our unit of measure. For a very smooth coast like that of South Africa, D ≈ 1. For more convoluted coastlines, D > 1 and so L increases as Δ decreases. Richardson found that the west coast of Britain yielded a value D = 1.25, close to the dimension of the snowflake. 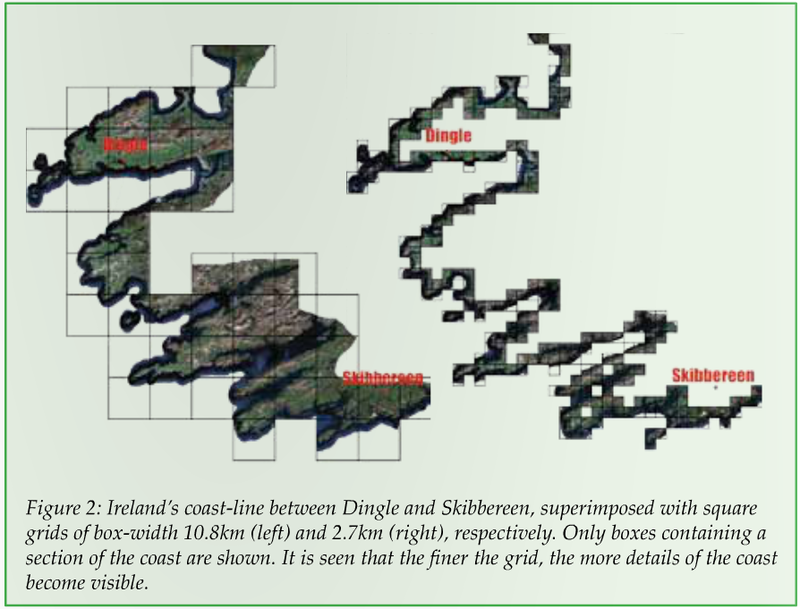 Recently a group of students in the School of Physics, Trinity College Dublin, under the supervision of Professor Stefan Hutzler, studied Ireland’s coastline using Google Maps and a measure called the box dimension: the length of a curve is estimated by superimposing a square grid on it and counting the number N of grid boxes that contain a segment of the curve. For a smooth curve, the product of N and the width W of a box is insensitive to the width of the box, and gives an estimate L = N x W of the length of the curve. For fractal curves, the length increases as the box width is reduced. The figure below, taken from the Science Spin article  shows the idea. 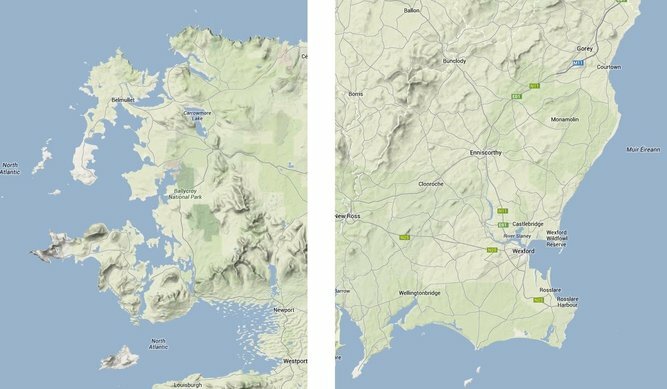 The Kerry coast with superimposed coarse grid (left) and fine grid (right). Only boxes intersecting the coast are shown (from ). Contrasting character of the NW and SE coasts (from Google Maps). Independently, and using a different method, a group in the School of Computing and Mathematics, University of Ulster, used printed maps and dividers of varying length (see McCartney, Abernethy, and Gault ). This yields what they call the divider dimension. The graph below shows the measured length as a function of divider length. Log-log plot of length versus step-size (from ). We see from this table that the value of 3,171 km given by the Ordnance Survey of Ireland corresponds to a step size of 1km. The close agreement between the two independent studies  and  confirms our ideas about the fractal nature of the Irish coastline and gives us confidence in the reported values of D.
 McCartney M., Abernethy G., and Gault L. (2010). The Divider Dimension of the Irish Coast. Irish Geography, 43, 277-284. Wikipedia article: List of countries by length of coastline. Peter Lynch’s book about walking around the coastal counties of Ireland is now available as an ebook (at a very low price! ).